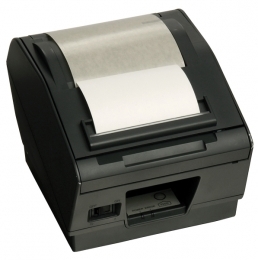 Star TSP828 offers all the functionality of a powerful label printer and integrates it into a compact receipt printer housing with a small footprint. Thanks to its single label dispenser, the TSP828 is very versatile it suits retail and warehouse environments, it produces shelf, price and product tags as well as address labels for mailings and product shipping or other logistics uses. Its high printing speed up to 150 mm per second ensures fast label production, thereby reducing waiting times. Maximum print speed 150 mm/sec. The TSP828 is not only fast in terms of label output, it also offer sharp, high-quality printouts with a resolution of 8 dots/mm 203 dpi. It can hold paper rolls with a diameter of 110 mm. This high receipt and label capacity reduces the need for bothersome paper refills and allows for long periods of uninterrupted printing. Labels of up to 108 mm width, or thermal paper up to 112 mm, offer ample space for a clear layout of information and bar codes, text and graphics. It is also possible to use smaller media with a minimum width of 41 mm, which saves users paper and costs. Additionally, the TSP828 is thus able to realise extravagant demands. This function is supported by the integrated transmitted light and reflected light sensor, which determines the exact position of the label, no matter how long it is. The patented EasyLoad feature facilitates simple and quick replacement of the label roll in a matter of seconds. Users do not need to thread the liner through guiding barrels and drums. Refilling paper under stressful conditions thus is an easy task even for untrained personnel. In order to respond to individual requirements in a professional manner, the TSP828 is available with a combined serial/USB interface, a parallel port or without any of them, if you wish to mount a replaceable Ethernet interface on-site. You will find all the drivers required for Windows and other operating systems on the included CD. In addition, a free OEM version of the BarTender label designer software is available with each TSP828.